As a child I took an immediate disliking to any of my fellow young’uns who, given the choice, opted for vanilla over chocolate ice cream. Madness, I thought to myself. Who in their right mind would choose dull, boring old vanilla over devilish chocolate! It was almost as dubious as that odd, insipid girl with droopy pig tails who disliked chocolate altogether. Naturally I am now more evolved and admit there are occasions for vanilla: drenched in chocolate sauce, for instance, or piled atop apple pie. 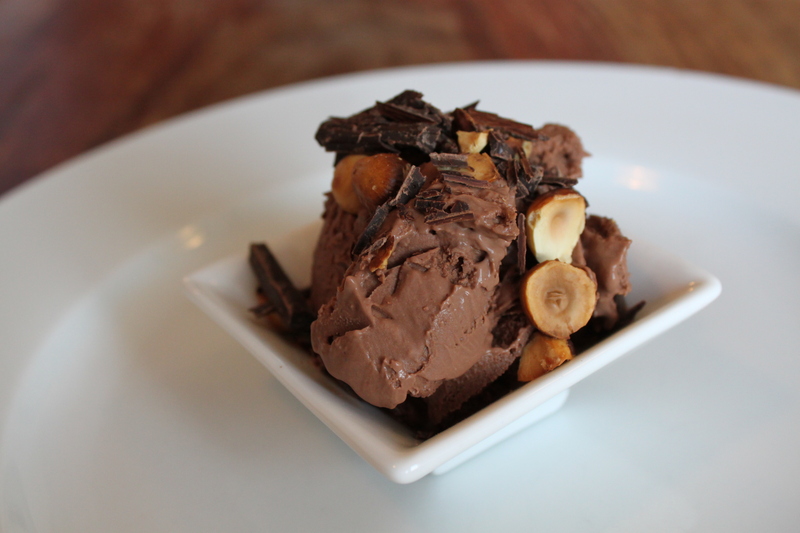 Nevertheless, rich chocolate ice cream remains my favorite, seconded by coffee or hazelnut. 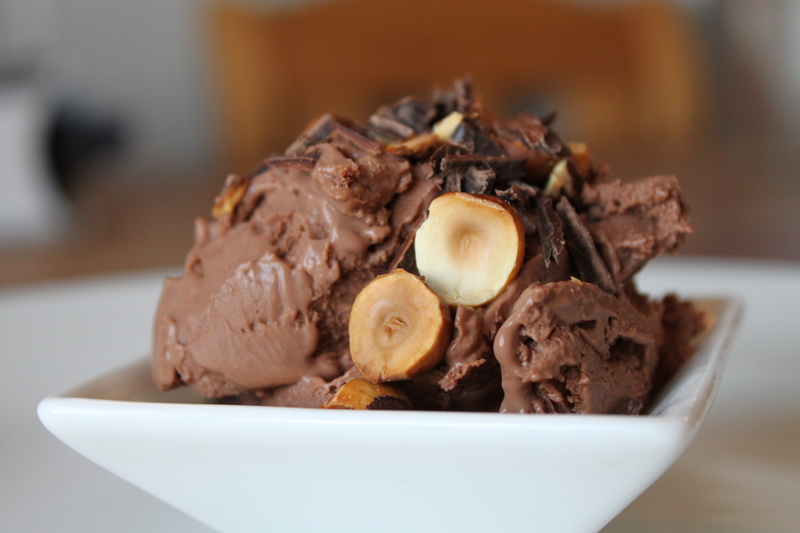 If you want to make ice cream at home there’s no need to buy an electric churn that will clutter up your kitchen collecting dust for most of the year. The key to making creamy ice cream without the aid of a machine is a high proportion of cream to milk and an egg-rich custard. The result is dense, silky, and potent. And while it cannot be described as diet fare, my belief is that an indulgent treat should really taste indulgent. Like whole milk, full-fat yoghurt, or a wedge of good Normandy Camembert, a little goes a long way. Make an ice bath by putting some ice and cold water in a large bowl or pot and then placing a smaller bowl (big enough for your pint of custard) inside. Pour 1/2 cup of the cream into the inner bowl and place a strainer on top. In a medium saucepan heat the rest of the cream and the milk with the sugar and a pinch of salt. Heat slowly, stirring often, until the sugar has dissolved and the liquid is beginning to bubble. Remove from the heat. In a bowl beat the eggs and then very slowly add the hot milk-cream mixture, whisking very rapidly so that the eggs don’t curdle. Pour the mixture back into the saucepan and whisk over a medium-low heat until well thickened. At this point the custard should coat the back of a spoon and leave a clear path when you run a finger across the spoon. Remove from the heat and strain into the cold cream. Melt the chocolate and add it to the bowl along with the cocoa powder. Whisk everything together until smooth, pour into a shallow tub with a lid, and place in the freezer. After one hour give the mixture a vigorous stir and freeze again. If possible, give it a further stir after 30 minutes and again after another 30 minutes. 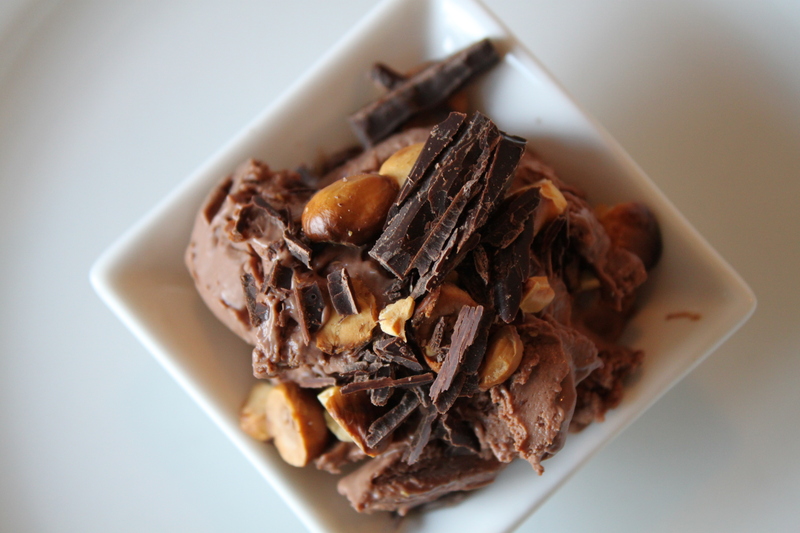 You will need to take the ice cream out of the freezer 30 minutes before you want to eat it and allow it to soften a little. One long meal . 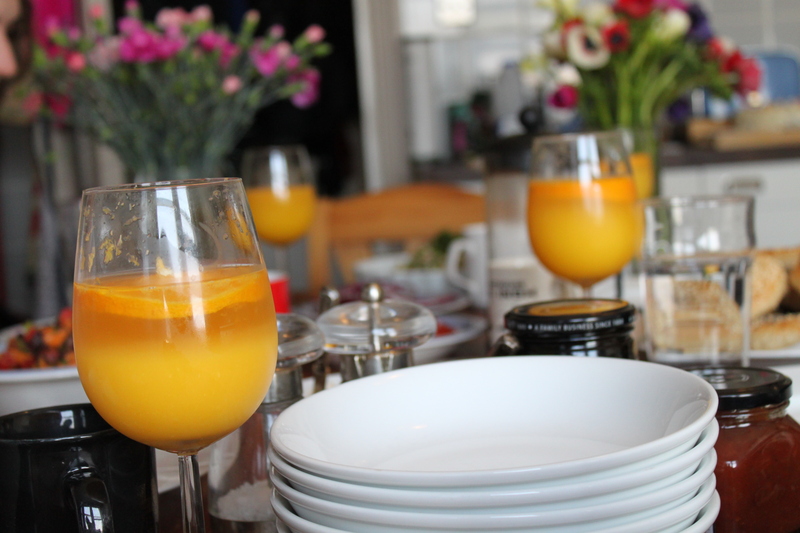 . .
Mimosas - let the brunching begin. 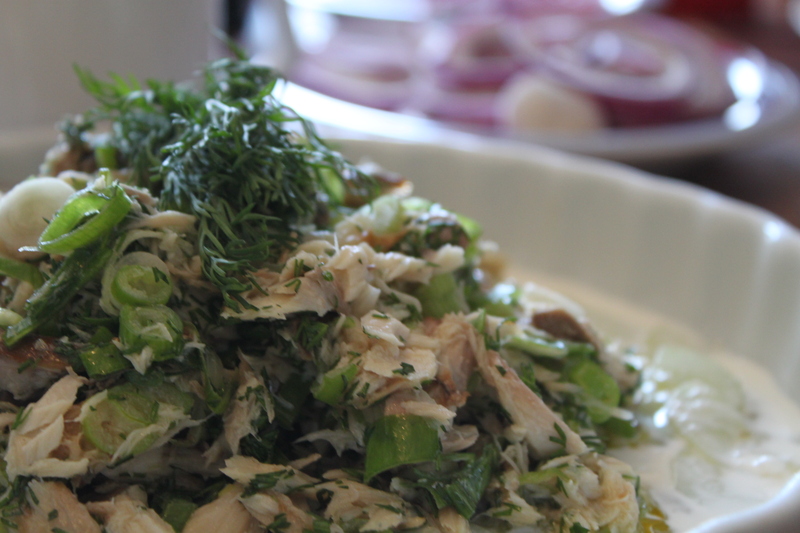 Smoked mackerel salad on a bed of creamy cucumbers. 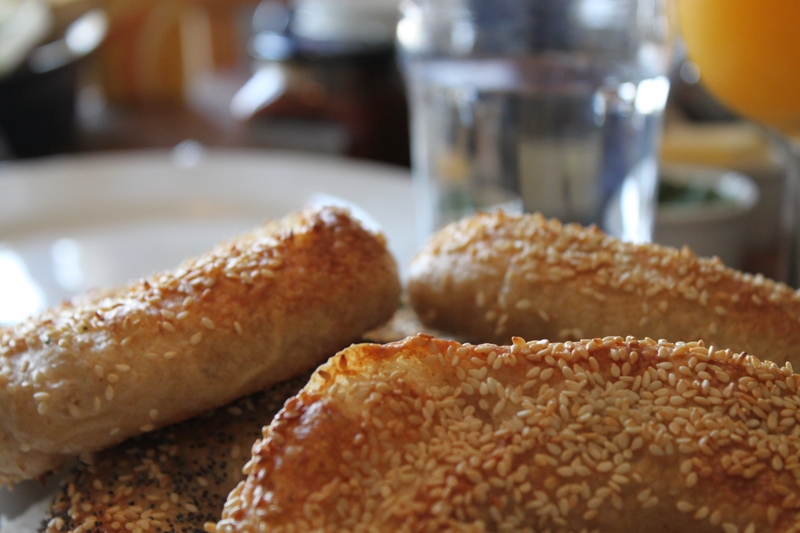 Sesame bagels, warm from the oven. 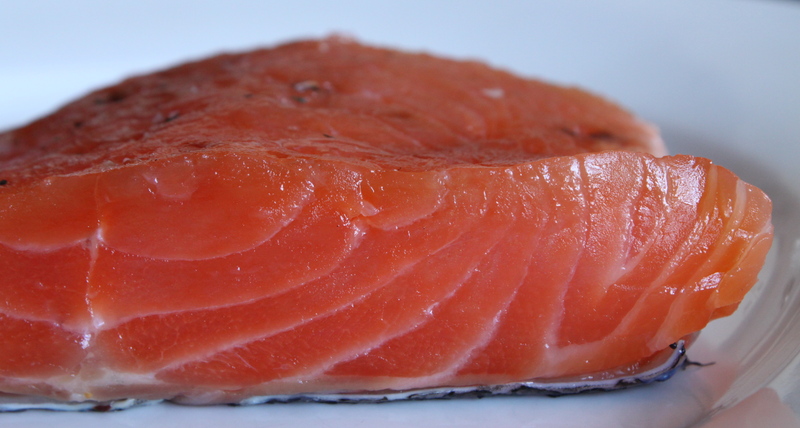 Salmon, transformed into gravlax with a two-day cure. 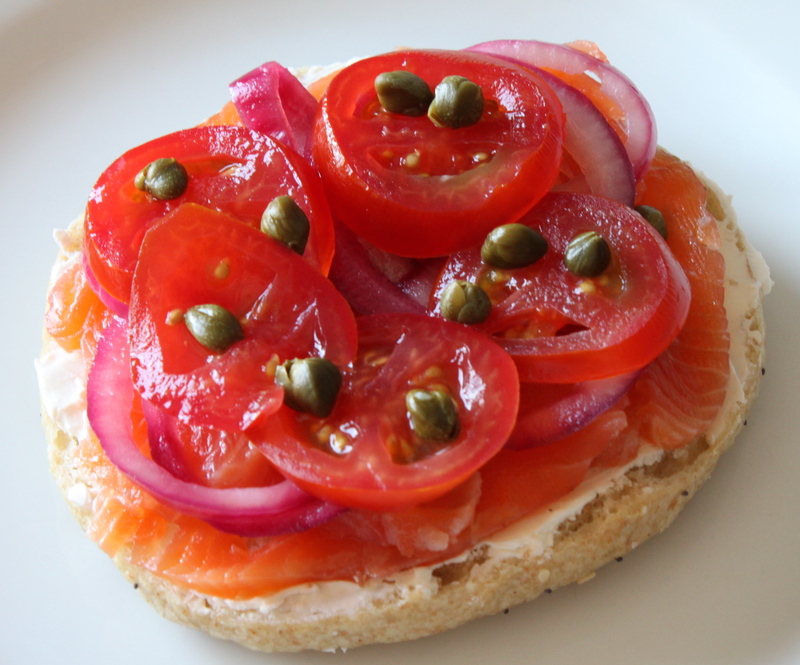 Bagel spread with cream cheese and topped with gravlax, red onions, tomatoes, and capers. Frosting fissures . . . 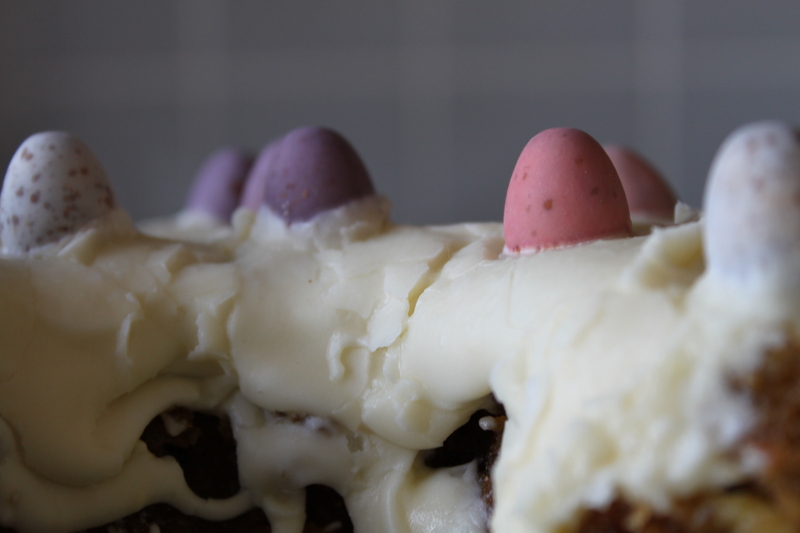 I thought about decorating the cake with elegant flowers or intricate piping and then succumbed to nostalgia, dotting the top with Cadbury mini eggs just like my mum always does - the best way. “Oh, basically smoked salmon,” I replied, hurriedly changing the subject. The truth was, I had only a vague idea of the answer. A self-respecting foodie, however, does not admit to such elementary ignorance. 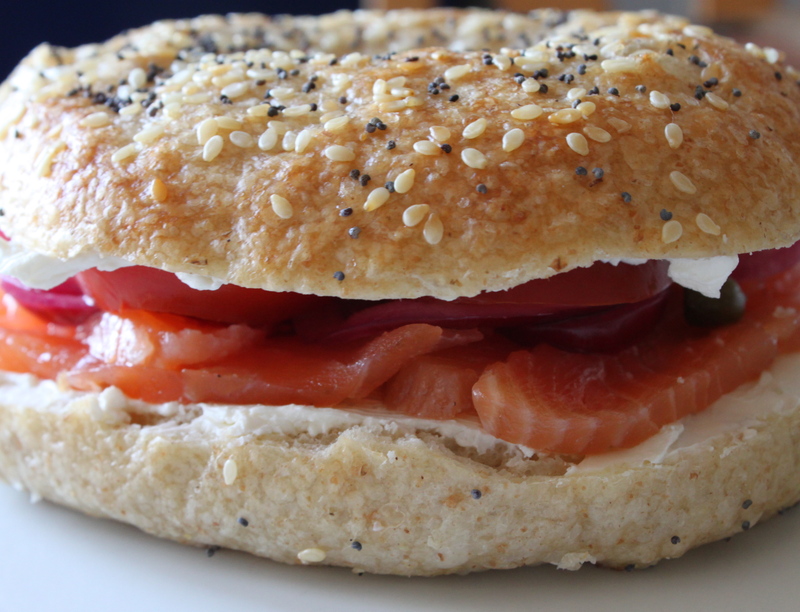 Sure enough, upon research I discovered that lox is cured rather than smoked salmon. Perhaps my hazy command of the facts is forgivable, as it turns out that the categories of smoked and cured fish are far from simple. Reading further I found myself immersed in a perplexing world of cold smoking and hot smoking, salt cures and brines, some with sugar or oil or both. There were recipes calling for herbs and spices, others drowning the fish in booze. Some methods required both curing and smoking. It was all rather overwhelming. Then I hit upon a familiar item: ‘gravlax.’ It is a delicacy I’ve devoured on several occasions, but never stopped long enough to wonder how it’s made. Yet here was a recipe right before my eyes. It came from an article by the indomitable Mark Bittman, long time food columnist for the New York Times. The article was entitled “Gravlax without fear.” Was there anything to fear? The prospect of a new and potentially dangerous culinary adventure was too hard to resist. I headed for the fishmongers. 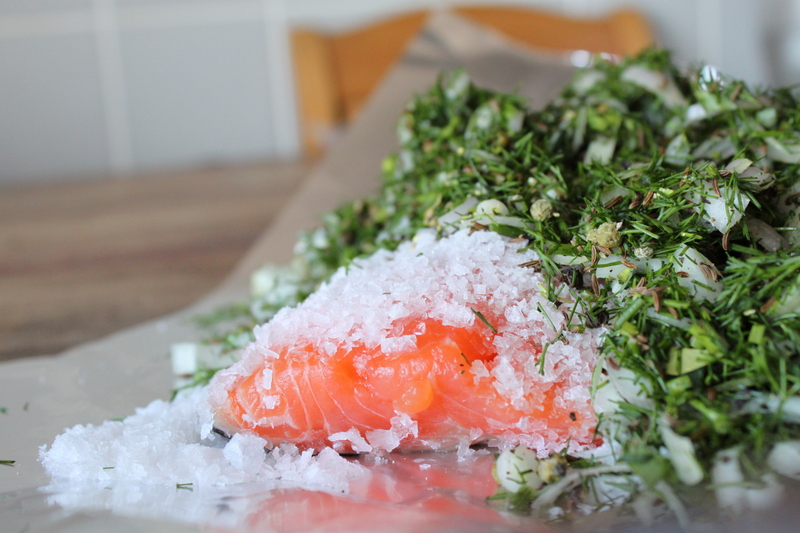 Gravlax, I learned, is a Scandinavian version of lox consisting of raw salmon cured with a mixture of salt, sugar, pepper, dill and perhaps a little aquavit for good measure (those tiddly Swedes). Traditionally, it is served atop a wafer of crisp bread or boiled potatoes and accompanied by a mustard dill sauce. According Bittman, this northern fare is needlessly embellished and sold for outrageous prices in New York restaurants. It has earned the status of posh nosh when in reality it is child’s play to prepare. The Bittman was right; gravlax is ludicrously easy to prepare. 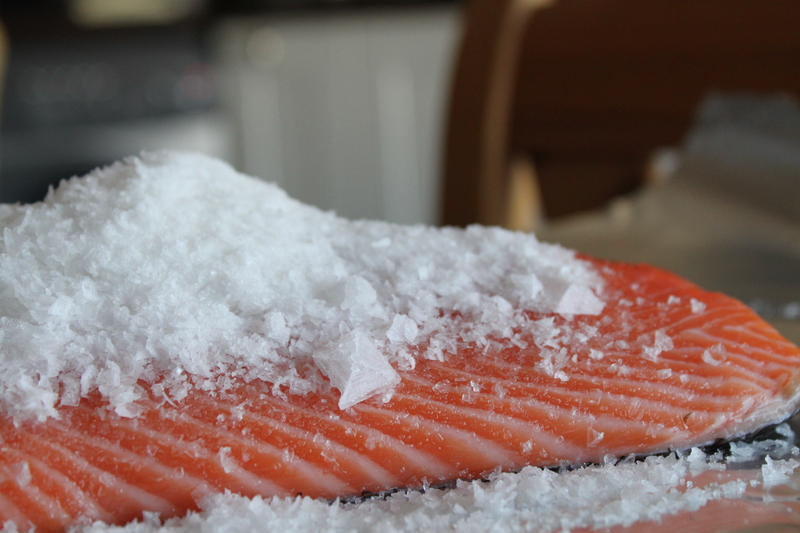 Salt draws moisture out of the fish while the herbs or spices subtly flavor it. The basics are as follows: Cover a fillet of salmon with a mixture of two parts salt to one part sugar and then with a layer or chopped dill and peppercorns. Wrap it all up and toss it in the fridge for two days. Et voila! You can leave it plain or improvise with flamboyant spice or citrus cures. I’ve chosen Tom Valenti’s version with less salt and a long cure (to be honest I mainly chose it for the booze factor; I cannot resist an excuse to get a salmon drunk). However, Bittman lists several equally enticing variations. As I pressed salt into the fillet of salmon, I wondered at the persistent appeal of do-it-yourself cooking. Why do I love making bread and pickling beets? Why do I get so much satisfaction out of home-made marmalade and frankly pathetic pork pies? And I am not alone. There has been a lot of talk lately about the growing interest in old-fashioned skills such as home canning and baking. The consensus is that this trend is a response to the recession, to general insecurity and a tightening of belts. But I find this argument unlikely. Anyone who has tackled home canning, for instance, knows that by the time you buy a canning kettle, enough fruit, the all important set of sparkling new lids (essential to guard against botulism), you have spent enough money to keep yourself in tinned pears for a lifetime. My theory is that our current interest in these half forgotten skills stems from more than mere neurosis. There is something magnificent about opening a jar of marmalade that you have stirred or watching bread rise that you have kneaded. Perhaps it is a childlike awe in the power of human hands. In an age in which many of us spend our days working with the intangible and abstract, or in rote mechanized movement, there is an undeniable beauty in the pure physicality of kneading dough to the perfect pitch or the keen eye in boiling jam to setting point. These acts distill the rawness of life; like salt to a salmon, they cure. Casting about for Easter brunch inspiration, I happened upon an enticing post in Dizzy Swallows, a wonderfully eclectic blog belonging to my friend Danielle Hendrix. This fearless kitchen goddess had taken on the challenge of bagel making, something I’ve been meaning to try for ages. That’s it, I thought, the perfect bruncheon centerpiece: a mountain of freshly baked bagels with a platter of different toppings. (Cold meats and lox for the carnivores, homemade pesto and cheeses for the veggies.) 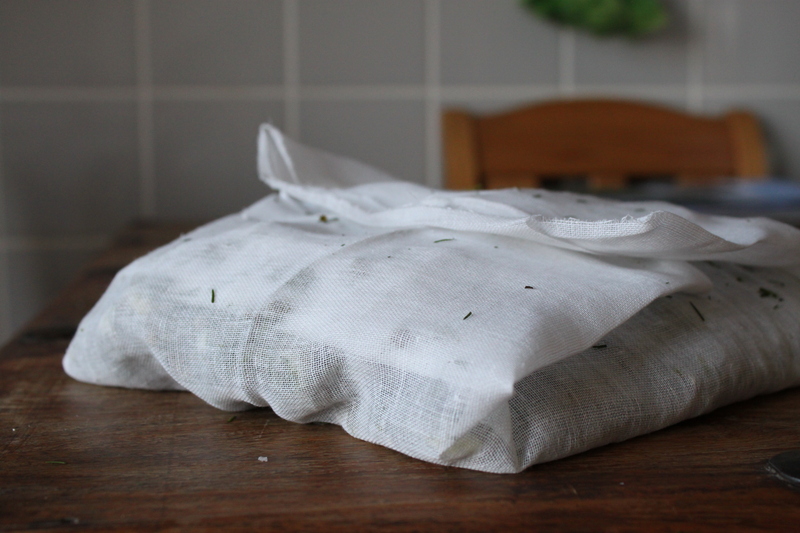 One look at Danielle’s post and I was elbow deep in a bag of flour, determined to master the art. 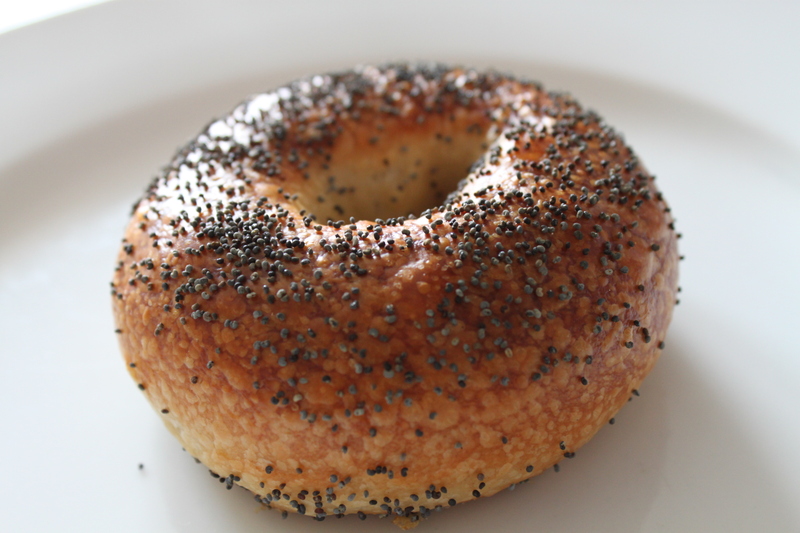 The bagel has a strange and murky history. Originating by most accounts in 17th Poland, it was a prototypical convenience food. As with many of the strange foods we eat today, the bagel’s shape was founded not on artistic flair but rather on pure pragmatism, enabling wandering bagel sellers to string a rope or pole through their wares facilitating transportation and storage. Yet this wheaten ring took on deeper significance, it’s unbroken circle symbolizing—even more than other breads—life itself. Furthermore, some sources claim that Polish women in the midst of child labour were told to ‘bite the bagel’ to ease their pain. With the influx of eastern Europeans immigrants in the 1800’s, the bagel was introduced to the United States and has since become a firm fixture of American food culture. Today, New York is considered the bagel mecca, where, according to fans, you can find the most flavorsome, chewy, and authentic specimens. 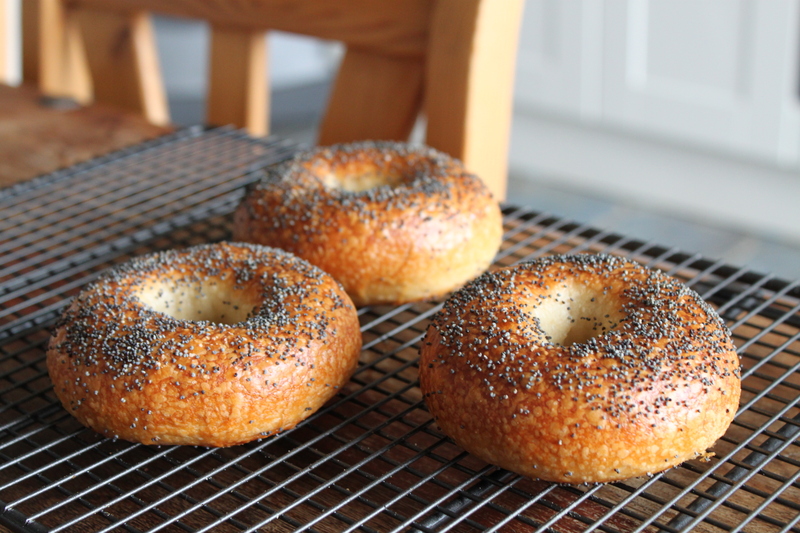 For those who have never tried anything but botoxed supermarket bagels (I suspect this is likely for many Britons since the bagel doesn’t have the same standing here), I beg you to search out the real thing, or failing that, to make a batch yourself. Despite requiring a little forward planning, they are easy to prepare and thoroughly worth the effort. Dense and chewy with a tight crumb and the warm aroma of hay, real bagels are a revelation. I made a test batch today with happy results. The recipe I used (Peter Reinhart’s, via Fine Cooking) calls for a minimum fermentation of eight hours in the fridge before baking. I left my dough to chill out for 24 hours for more development and thus deeper flavor. Next time I want to try some variations such as adding a touch of whole wheat or rye to the dough for a bit more nutty richness. I am a chocoholic. I love the divine bean in all incarnations: cakes and ice cream, cookies and bars. Hell, I’ll cram chocolate into breakfast or booze if I can swing it, not always an easy feat. And of course I love hot chocolate. . . or at least the idea of it. What could be better on a chilly day than a mug of creamy molten chocolate. It is a heavenly thought. Yet when lip meets mug and I take that first sip disappointment is quick to replace anticipation. The chocolate is too weak, too sweet, too heavy. The milk clings to my throat, thick and cloying. I have a vague sense of being strangled. I took a polite sip. And then another. It was unlike anything I’d tasted before. Every cell in my body was dancing, my head was reeling. This chocolate tasted otherworldly; unimaginably rich and complex, the flavour was elusive, shapeshifting. There was citrus and smoke, coffee, hazelnuts and malt. I asked Paul what was in it. 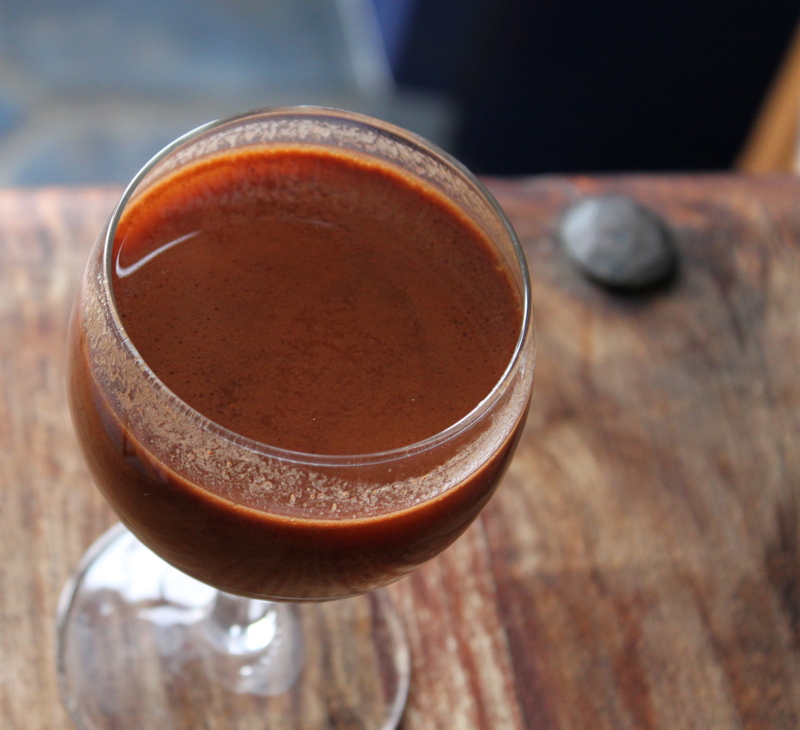 So this is why Mayans revered the bean, calling it Theobroma Cacao and ritually drinking it to prepare for everything from an amorous encounter to a vicious battle. It truly is a food of the gods. Heat all ingredients together and whisk until dissolved. Adjust components to taste. Pour into cup and imbibe. Note: As you can see there are little oily bubbles from the cacao butter. Ugly, but take no notice. The taste is all that matters here. Easter is approaching, the besmirched London streets smell like blossoms, and bunnies are proliferating in shop windows. Although I have not been observing a lenten fast by any stretch of the imagination, I fully intend to observe an Easter feast. It is curious how Catholic I become when food is on the religious agenda. So I have decided to host an Easter Brunch. My American friends and I spend a fair amount of time, in true expatriate fashion, eulogizing over bunches past. Oh the hash browns and bloody marys; the crispy bacon and lox laden bagels; the huevos rancheros and the pancakes—oh those great, excessive stacks of fluffy, polka dot blueberry pancakes. It is enough to make Yank homesick to weeping. The English, although proficient at a greasy Sunday fry-up, do not have the same bruncheon (you know, kind of like ‘luncheon’) tradition. They tend to stick resolutely to the tried and tested formula of bathing all ingredients—eggs, sausages, mushrooms, tomatoes, and toast—in the grease of the frying bacon. At least that’s how my mother approached the task. And although it is delightful method of clogging the arteries, it does become mundane. An American brunch, however, is a wonderfully dynamic event; morphing to meet your hunger of the moment. 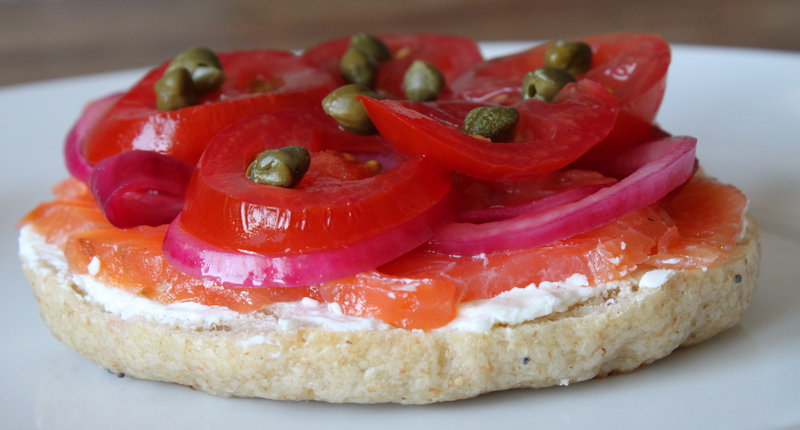 It can appear as a fresh, enlivening meal of lox draped lusciously onto a cream cheese topped bagel and adorned with capers, red onions, and a squeeze of lemon; it can remedy a night of excess with enough spicy potatoes to pummel your hangover to death; and it can sweeten your morning with the beaming architectural majesty of a Belgium waffle. And so, in honor of the baby Jesus and to cure my case of bruncheon nostalgia, I am planning an Easter feast. As yet I have not decided on the details; will it be an ode to my New Mexico days or a love song to Seattle? Most likely it will grow into a shaggy mutt of a meal, with choice pickings from a range of my favorite morning fare. 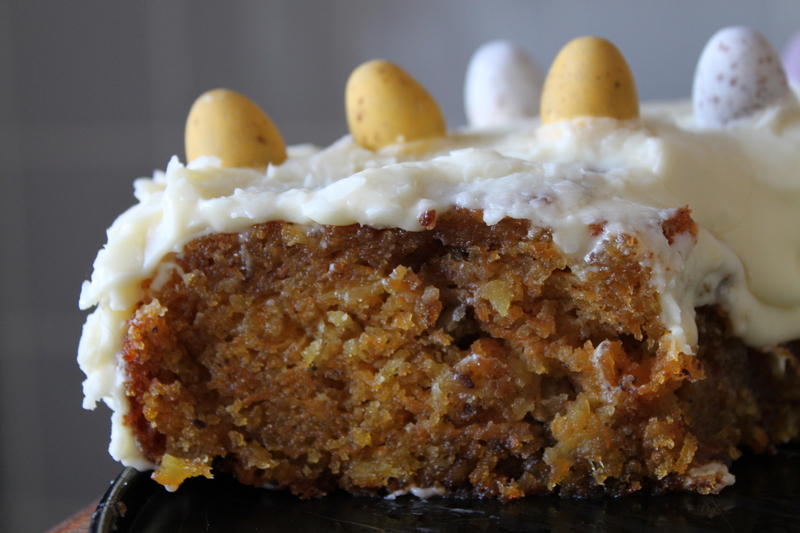 At this point I am sure only of the following: there will be hot cross buns, like mummy used to make (only a bit better); a gorgeous carrot cake decorated with flowers and chocolate eggs; and we will drink good coffee and mimosas . . . but wait, surely bloody marys can’t be left out of the fun! Also, I have been longing to cook crab, having never attempted dealt with this crustacean in its live, fully armed form. And since I do not wish to inflict bind experimentation on my friends, I will be testing out some crab recipes in the next few weeks, and possibly some further unchartered territory. Bagels, anyone?
. . . to be continued (after some kitchen research).